Reliance were a very small independent operator, who ran a service from York To Helmsley, along the B1363. The owner had a motor repair garage a few miles out of York on that road. As far as I am aware, in the 1950’s, Reliance only had one vehicle – a 1950 Daimler half cab in green and cream livery; at some point, this was replaced with an underfloor Daimler in orange and cream. I remember the half cab Daimler being driven by an elderly gentleman – the proprietor – or a younger lady who I understand was his daughter. Reliance’s terminus in York was Exhibition Square. The term ‘Square’ is slightly misleading, because the square is only a vacant space outside the York City Art Gallery on a short street connecting Museum Street and Bootham. It provided a car parking space for visitors to the art gallery or some York City offices which were situated along the street; the York Theatre Royal is on the other side. However, it did enable buses to turn without reversing, and thus was a practical terminus both for Reliance and for York Pullman Bus Co., whose service to Stamford Bridge also started and ended there. (the Old Bus Photos site has a great picture of a York Pullman AEC Regent V, taken at its terminus in Exhibition Square). Exhibition Square was an important setting down and picking up point for local buses, (as well as a picking up point for a number of West Yorkshire longer distance services – e.g. Service 80 to Thirsk, 43 to Scarborough, 91 to Whitby), because it is close to York city centre. There was a line of bus stops on both sides of the road; Reliance’s stop was on the side opposite to the position of the York Pullman photo, closest to Bootham Bar. The route to Helmsley was very rural, with only a few villages along the route. I don’t know the frequency of the service but the traffic volume would not have justified a great frequency. Reliance did, however, cater for a considerable volume of passengers who worked in York, and its early evening departure to Helmsley was always pretty full. It was unique to see a lady driving a bus in those days. I remember an old West Yorkshire driver, (a chap called ‘Digger’ Ward, who operated the West Yorkshire city tour coach), telling me – whether this is true or not, I don’t know – that the gear change pedal used to work the Daimler pre-selector could occasionally kick back, and he would speculate on how the lady would cope with that without breaking her ankle. Happy days! Thanks Roy for a fascinating insight into a company I never really knew. When I took this photo in Helmsley Market Place in 1959 (using a much valued colour exposure from my Dad’s camera), little did I realise that, 50 years later, it would be "exposed" to an audience then undreamed of. It looks like the driver could be the proprietor? “Digger" Ward was absolutely right about the gear change pedal on the pre-selector Daimlers – well, actually he wasn’t quite right enough as the pedal was likely to do far worse than to kick back – it would kick back twice as far as the normal stop often causing injury to hefty men, never mind to ladies. There were two chief causes. Firstly, if there was wear or poor adjustment in the linkages, the device in the gearbox which was intended to tension the appropriate band would fly through a gap between two with the painful result mentioned. Otherwise failure to either accurately select the required gear on the steering column quadrant, or to depress the gear change pedal fully to the floor, would have the same effect. Many drivers learnt the hard way that it was not a clutch pedal and was not to be treated gently and gradually, but fully and decisively. Reliance was a bigger undertaking than you suggest. Edward Sheriff was the proprietor and his eldest daughter Joan took her PSV test in the early war years. She became Mrs Thornton on her marriage and was still involved with the business in the 1970s. By this date her younger sister Carol had taken on the business with her husband Richard Shelton. 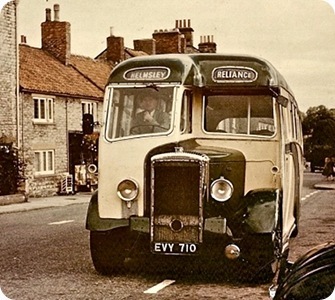 In the 1950s the service to Helmsley ran every three hours and the fleet numbered nine buses, kept at Sutton on the Forest and at Helmsley. Pullman buses to Stamford Bridge left from Merchantgate, and the Linton and Easingwold buses from Exhibition Square. Reliance is still running today in the very capable hands of a new owner. Naturally, I defer to ‘anonymous’s better information on Reliance; I really only came across them by way of seeing their Daimler in Exhibition Square and on car trips out of York. They are also quite right about York Pullman’s services – just age and cloudy memory on my part, I’m afraid. I was simply not thinking about their Linton service. It also occurs to me that ‘anonymous’ must know more about Reliance than he or she has told. A three hour service between York and Helmsley certainly wouldn’t justify nine vehicles and two depots, so what else did they do? I wonder if they could possibly be persuaded to tell more? Reliance in the 1950’s was indeed a bigger operator as stated in one of the earlier posts. Apart from the regular service between Easingwold and York which would stop at individual homes/farms, official stops and not, along the York Road (B1363) as well as villages along the way, they provided a regular service for pickups and delivery of school children to Easingwold Grammar/Modern school from the surrounding villages like Sutton, Huby, East Moor, Stillington and further to the West and North. The original location was a petrol station and a substantial repair/depot on the York Road North of York South of Sutton on Forest which housed a number of vehicles, like the half cab style, all of them with manually sliding doors, a smaller type with the pushed forward bonnet, there were two of these as well as a number of newer types. All in the green and cream livery except one of the newer type which had automatic doors, this for some reason was orange and perhaps some cream trim. Roy Burke asks why Reliance needed 9 vehicles to operate the service from York to Helmsley. Today services are much more frequent to meet the different travel habits of the population, but in the past this was different. There were key times when everyone wanted to travel, eg to York in the morning and out to the villages at teatime. Reliance regularly had three buses on some departures, one all the way to Helmsley and the others along part of the route. Even when I knew the company well in the 1970s they had two buses full out of York together at teatime. The present service is very high quality and has received national acclaim, a great credit to the owner. Travelled in a Barnaby built coach in Devon at Greenaway. Agatha Christies place. The Driver told us there are only three Barnabys left in service/preservation. Can any one throw any light on this please.? The only extant Barnaby-bodied coach I can think of is JVY 516, a preserved AEC Regal III ex York Pullman. The "Classic Buses" website lists five half-cab single-deckers that have carried Barnaby bodies. One was re-bodied in 1962 and is now in Belgium and one is now a recovery vehicle. That leaves three. One is the York Pullman Regal, there is a York Pullman Dennis Lancet but that seems to be in very poor condition. The only other active one is the Bullock and Sons (Wakefield) PS1. That is likely to have been the one seen in Devon. David the coach you refer to is AHL 394 – See it at this link you have to scroll down a fair way. There is a shot of AHL 694 taken a few years ago at www.sct61.org.uk in the West Riding pictures There is also a few shots of similar vehicles in service with West Riding. After reading about the early years of Reliance I must make a comment. We have an old friend who was brought up at Ampleforth and on a Friday and Saturday night if him and his friends went into York for a night out and there were more than enough passengers for the last bus back to Brandsby Ted Sheriff would follow on behind with his car with the extra passengers. I cannot see them doing that now. As well as the preserved AHL 694, West Riding Auto had a number of similar Barnaby bodied buses as Chris indicated. These were inherited from Bullock and Sons (Featherstone) in 1950. Bullocks had been customers of Barnabys since the 1930s having buses/coaches (including double deckers) rebodied by them in Hull during the 1940s. Re Barnaby’s Motor Bodies (Hull) Ltd there is a two-part history of the firm in Vintage Roadscene Vol 7 numbers 27 & 28 which contains an incomplete list of the Commercial non-psv bodies. I did submit a companion article on Barnaby’s Bus and Coach bodies to Messrs I Allan but they were not interested so it was returned to me and it has sat in my filing cabinet ever since. V Roadscene published a readers letter in VR no 29 picking out an error of mine about the final takeover of the firm so perhaps that put an end to it. No praise for the research I had done from 1983-1989 tracing Barnaby’s history from 1872-1960. Edward Sheriff started out with Mr Wilfred Mennell at Haxby with a 14 seat Ford T each, Bodied and painted by Barnabys at Hull in ‘Lake & Yellow’ 21st February 1923 the Fords began a York-Haxby service named "The Cosy Car Service". The later "Reliance" York to Helmsley service was the result of Mr Sheriff ‘going it alone’ after 1930. Don’t be put off by nit-pickers. We all make mistakes – I know I do – and I’ve been pulled up occasionally by people on this forum. (Quite rightly). If your research was sound and most of it accurate, perhaps you should revisit it and revise it with corrections. Histories of small but not insignificant companies are fascinating – and not very common. I have just purchased AHL 694 the Leyland Barnaby PS1 and intend to start a sympathetic restoration & recommissioning. Any history would be gratefully received, especially colours when new to Bullocks. I have just submitted a picture to Sct61 showing AHL694 with a representation of Bullock livery applied to tidy the vehicle up. It may be a few days before it appears on that site. Also Dewsbury Bus Museum may be interested in keeping in touch with you and may be able to assist with information from their archive. Good to see you have purchesed AHL. I have the only other preserved Barnaby JVY 516. My recollection is that AHL whilst a runner needs a lot of wood replacing under the panels but presume you know that as you are looking to restore. Any help I can give let me know. I can’t contribute, anything technical, but all these posts bring back childhood memories. When I was a boy, around 12yrs old, I caught the Reliance bus from Huby to York. I had five shillings every Saturday, which I earned from hard work. I would go to the Cinema in York, which offered a choice of five or six cinemas, have fish, chips and peas, bread and butter, and a pot of tea, 2/6d and catch the bus home. The last bus left the De Grey Rooms, Exhibition Square at 10pm, full to the gunwales, if you missed it, you walked the nine miles to Huby. Sherrif’s had a garage on Wiggington Road on the way from York to Sutton on Forest. I am now 89years old but I remember later when I lived at Brandsby, the service operated, thru Brandsby, Crayke, Sutton, York.